In 1953, the Kiwanis Club of Carlisle donated two acres of land which became part of the LeTort Park. 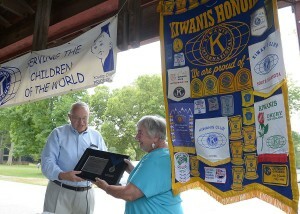 Throughout the years, the Kiwanis Club has helped with the upkeep and renovation of the park. This park symbolizes the International Kiwanis Club mission of serving today’s youth. In August of 2015, the Kiwanis Club was finally recognized for all of their work at the park. More information about the Carlisle Kiwanis Club’s land donation can be found here.